Saffron Screen opened in 2006 and is supported by 15 part-time staff and over 100 volunteers, all of whom live locally. 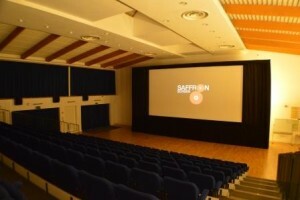 Saffron Screen is your not-for-profit independent community cinema. Our professional auditorium boasts a full size screen, 200 cinema seats, Dolby Digital surround sound and both 35mm and digital projection equipment. Ticket and refreshment prices are kept low to benefit all and parking is free. Based within Saffron Walden County High School, we are open every Friday, Saturday, Sunday and Monday, with additional screenings in the school holidays, and show a range of mainstream, independent, art-house and children’s films as well as streaming special events from around the world. Our mission statement: to be an independent community cinema screening a wide range of films and events and seeking through cinema to entertain, educate, create a shared experience and improve the quality of life for everyone in Saffron Walden and the surrounding area. Saffron Screen opened in 2006 and is supported by 19 part-time staff and nearly 100 volunteers, all of whom live locally. We are very proud of our cinema and welcome you to join us for a film or event soon. Saffron Screen strives to deliver the best service. Should you have any comments or feedback, we would appreciate hearing from you at feedback@saffronscreen.com. Saffron Screen is the trading name of Saffron Walden Community Cinema Ltd, a registered charity (no 1113259) and company registered in England and Wales (no 5626997), registered office 10 Market Walk, Saffron Walden CB10 1JZ.